The above quote is a favorite of movement and manual practitioners all of all stripes. Although appropriately succinct and often true it is decidedly unhelpful when trying to figure out why you have knee pain after a run or your low back pain flares up after a night of dancing. So Where Exactly Is The Pain Coming From?! 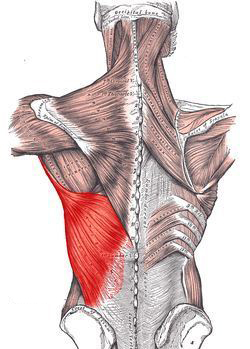 One attempt at an answer comes in the form of the Anatomy Trains...12 lines of myofascia that connect the body and serve as a guide when hunting for the “culprit”. A basic tenet of connected anatomy is that the overstressed and painful tissue (the victim) is working harder than it should to compensate for some distant underperforming or malaligned structure (the criminal). This is not to say that the pain can’t derive from exactly where it hurts. Clearly if you get hit in the head with a baseball there is no other plausible explanation for your pain than blunt force trauma. But if you have recurrent shoulder pain after working out one plausible explanation is that your rotator cuff muscles are not firing appropriately due to inhibited scapular stabilizers. Why are the scapular stabilizers inhibited? Well possibly they are not adequately supported by a shifted or rotated ribcage that is resting on a tilted lumbar spine. Why is the lumbar spine tilted? Well possibly it is compensating for a tilted pelvis that is in turn resting on a shifted knee and an underactive arch of the foot...Yes your shoulder pain can be related to your feet! This is not to unnecessarily muddy the waters but it does illustrate the point that pain is very often a bodywide problem requiring solutions that address the whole of the person. So How Can Anatomy Trains Structural Integration Help? Anatomy Trains Structural Integration recognizes the structurally interdependent nature of the body and seeks to unwind these patterns over the course of 12 sessions. The initial 4 sessions look to address postural adaptations in the superficial myofascia of the Superficial Back Line, Superficial Front Line, Lateral Line and Spiral Line. These lines collectively form the “superficial sleeve” of the body from head to toe along the front, back and sides of the body. A primary focus of these initial 4 sessions is to differentiate structures and layers of fascia that may have become “glued” together and are possibly restricting the adaptability of the system as a whole. In short we would like to build a base of support in which to release the patterns that may be held in the deeper structures. The middle 4 sessions will focus on the core structures of the body. Core is a wildly overused term with seemingly endless unique definitions. Anatomy Trains offers the "Deep Front Line" as their variation on this theme. This line of connected anatomy stretches from the deep compartment of the lower leg and the inseam of the thigh, up through the pelvic floor and the abdominal balloon, into the basket of the ribs, and finally ends (or begins based on perspective) with the deeper structures of the neck and cranium. The patterns held within this more complex stabilizing structure of the deeper anatomy are generally “older” in nature and have been compensated for by the superficial outer lines. The movement limitations that are of a more difficult to “fix” nature often have a basis in this wonderfully complicated stabilizing center of our structure. The final 4 sessions will bring it home focusing on integration of the structure as a whole. We will attend to any details that are demanding of more attention but the intent of these integrative sessions will be to coordinate the appendicular body with the axial body in gait, breathing, postural awareness and the freedom to move and negotiate the world as one sees fit. What Can I Expect From A 12 Series? The Anatomy Trains Structural Integration 12 series has at its heart the intent of providing you with options. Options to move your unique structure in whatever dance with the world you choose and with as much ease and grace as humanly possible. It is not an imposition of “ideal” posture and it is not meant to diagnose or “fix” you or otherwise absolve you from all orthopedic ills. Enjoy the process and practice of working with your body and its seemingly infinite potential for adaptation and change.